In Home Viewings: "Killer Elite"
After his last job goes badly, Danny (Jason Statham), a world renowned hitman, leaves the game and moves into isolation in Australia. His mentor, Hunter (Robert De Niro), keeps taking jobs and before long he gets himself into trouble with a Middle Eastern sheik. In order to win Hunter's freedom, Danny must take on that inevitable "one last job", a contract that will require him to kill three former SAS agents who were connected to the deaths of the sheik's sons during a military operation. Danny assembles a team and sets out to fulfill the contract, an easy any task for a man of his skills. He draws the attention, however, of Spike (Clive Owen), another former SAS agent and a member of a secret society known as The Feathermen, who takes it upon himself to prevent the hits from taking place and to bring Danny in for interrogation. I didn't expect much from Killer Elite, a sentiment I attempt to take in with me whenever watching a Jason Statham movie. I assumed the plot would be thin and the dialogue would be to the level of a third grader and I was willing to accept that as long as the movie delivered quality action sequences and a general good time. In essence, I did my part by bringing a low standard and a good attitude to the table. Unfortunately, Killer Elite failed to carry its share of the load. This movie is so bad that I almost didn't write a review because I'd already wasted two hours of my life by watching it and didn't want to give up another hour or so to writing about it. I'm sad that I didn't see it earlier so that I could include it in my "Worst Movies of the Year" list because it DEFINITELY should own a place in the bottom five. Simply put, there is absolutely nothing to like about this film. Nothing. 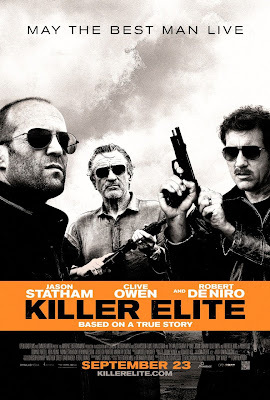 Killer Elite manages to squeeze every action movie cliche you can think of into its plot. You've got the "one last job" element at play. You've got the mentor-mentee-bad-guy relationship thing happening. You've got the villain who's really not a bad guy and he shows it by shooting people in the knees (crippling them for life) instead of killing them. And the list goes on. It's embarrassing how unoriginal and completely uninspired Killer Elite really is. With a cast as talented as this one is, the least director Gary McKendry and writer Matt Sherring could do would be to create a plot and an atmosphere in which the actors could thrive. Clearly no one in the cast cared about making this movie. I've sadly come to expect that from De Niro in these settings (that's one of the most depressing statements I've ever made in this space) but even Statham seems completely disinterested, like a man who knows he's working on a doomed project. This is a guy who goes all out in Crank, a wretched film that only made it to theaters because Statham rocks it so hard; how bad does the on-set vibe have to be for that guy to not care? 1.) The plot is so overly complex that it's next to impossible to follow from a logical standpoint. By that I don't mean that it's "smart" or "over my head." I mean that it's a jumbled, convoluted mess that was structured poorly in the first place and probably edited poorly in re-writes. This is a bad, extremely thin plot that doesn't make a bloody bit of sense and in order to cover those holes, the writer(s) adds in a whole bunch of junk to make it look more complex than it really is. There are approximately 100,000 worthless plot twists and turns in this movie and I'm probably under valuing that number. 2.) More egregious in my book, pretty much every character in this film makes idiotic decision after idiotic decision and these decisions are the only way that the plot can keep moving. This is perhaps my least favorite movie trick ever; it's the main reason I hate horror movies. If your plot depends on your characters making decisions that no human with the IQ of a three-toed sloth would make, then it's a bad plot and you should stop making your movie. In Killer Elite, every character operates under the three-toed sloth line. Keep in mind, these are all highly trained, intelligent covert agents who have only lived as long as they have because they were, presumably, good at making decisions and keeping themselves alive. But that doesn't stop them from running off into the path of a large truck or not searching a known enemy for weapons. I'm pretty sure even my wife knows that if your adversary is strangling your colleague and they're close enough to touch noses, you probably shouldn't shoot said adversary in the back of the head with a high-caliber pistol because, gosh wouldn't you know it, the bullet is likely to go through and kill your friend, too. Unfortunately for one of the characters in this movie, another highly-trained, super-awesome special agent did not know this scientific fact. Basically what I'm saying, dear reader(s), is that you absolutely should not see Killer Elite. I know it looks like it could be fun, I know it looks like the perfect, "It's Midnight and I've Already Watched Sportscenter and this Just Came on HBO" movie. But trust me, it isn't. Save yourself and stay away.